ExeOutput for PHP suits your needs? Buy a license now and receive your activation code in minutes! One license for you, and distribute your compiled PHP applications to an unlimited number of customers (royalty-free). ‌ a license that never expires for the purchased version. ‌ no nag messages in your PHP applications contrary to the Trial edition. ‌ no forced expiration of your PHP applications contrary to the Trial edition. 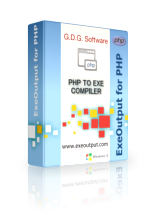 ‌ no royalties fee: you buy a license of ExeOutput for PHP for yourself and you may then distribute your compiled PHP applications to any end user (according to the license agreement terms). There is no extra fee required for end users. ‌ After placing your order, you instantly receive license details by email with instructions about how to upgrade from Trial edition to the Registered one. If you already have received your activation code, connect to your account here. ‌ * All prices listed are subject to the local applicable sales tax/VAT if any. Prices in Euro are mandatory for orders from within Europe. Prices are subject to changes without notice. ‌ If you plan to purchase several licenses, please contact us for possible discounts. ‌ One end user license allows you to activate your license on three computers simultaneously provided that the registered user (Named User) is the only individual permitted to work with the license. A deactivation facility is provided, allowing you to transfer your license from a computer to another one. Please review our refund policy before placing an order. When you purchase a license, your activation code will always work with the version of ExeOutput for PHP you purchase. In addition to the license, you are given a 12-month maintenance. If you let your maintenance expire, upgrades will cost you 80% of the new license price (25% more than one-year maintenance). Extend your maintenance service by 12 extra months and you will enjoy 24 months of free major and minor upgrades, priority for free basic technical support by email and support forum. With this option, you save 65% of the new license price for next upgrades. This option allows you to remove any visual trace that your applications were built with ExeOutput for PHP: for instance, you may remove the "Built with ExeOutput for PHP" mark displayed in the about box of your applications. You can then advertise your own company only.